Nepal and Bhutan Tour- 06 Days is a cross country cultural exploration in Nepal and Bhutan. These two beautiful nations in South Asia are the perfect destinations to discover the Hindu and Buddhist cultural wonders. The tour begins in Kathmandu with an exploration of Hindu and Buddhist World Heritage Sites, including Swayambhunath Stupa, Boudhanath Stupa and the Pashupatinath temple. You can explore the cultural mysteries and the unique medieval craftsmanship. Flying to Bhutan, you enter into the cultural land, which is also known as the last Shangrila. Various colorful monasteries, chhortens, dzongs (fortresses), temples, and other cultural and historical landmarks can be explored during the tour in Bhutan. Basically, you take a cultural excursion around Thimpu and Paro and explore Kuenselcholing View Point, Memorial Chhorten, Tashichho Dzong, Tiger’s Nest (Taktshang Monastery) and the Farmhouse. The tour ends in Kathmandu once you fly from Paro and take a final departure. Day 04: Drive back from Thimpu to Paro. Day 05: Fly back to Kathmandu. Day 02Kathmandu sightseeing.Breakfast at the hotel. Then we set out for the sightseeing tour in Kathmandu, exploring some of the unique monumental sites that are enlisted in the World Heritage Sites of UNESCO. The temple is located at the top of the hill in Kathmandu, which is a 5th century religious significant site. It is regarded as a self-sprung monumental site. For the Buddhist pilgrimage trip or tour in Nepal, Swayambhunath stupa remains the first selection in the Kathmandu valley. One of the UNESCO monumental sites, Swayambhunath is also popular as the monkey temple, having uncountable monkeys. Newari Buddhism is one of the major features here, which is known as Vajrayana. The eyes of Buddha represent wisdom and compassion. Climbing the steps up the hill top is believed to be the ladder to lead you to the state of enlightenment. The temple is one of the most sacred and popular pilgrimage destination for the Hindu devotees around the world. It is located on the banks of the holy Bagmati River, about 5 km distance at the east of the valley. It is listed as UNESCO site and travelers love to explore the 15th century arts and architectures around the area of the temple. It has got wonderful pyramid shaped temples, extensive cultural heritages, Ashrams for the old people and Sadhus along with remarkable inscriptions. It becomes very special during the Shivaratri festival and nearly one million people visit the Pashupatinath temple. Boudhanath Stupa is located about 10 km east of the Kathmandu, which is antique and a huge mandala. The stupa is one of the biggest among this type. The surrounding of this stupa is dominated by the Tibetan refugee settlements. One of the prominent World Heritage Sites in the Kathmandu valley, Boudhanath is a highly adored tour and pilgrimage destination. Buddhist monks and devotees can be seen to be doing religious way of paying homage around different corners of the Stupa within. Day 03Fly to Paro Airport and then drive to Thimphu (2320m), the capital city of Bhutan. (1.5 hrs drive)The picturesque flight to Paro offers the precious sceneries of the snowy peaks including Mt Everest (8848m) and the surrounding ranges. Arriving at Paro, meet the representative of Nepal Kameleon Holidays and take a 1.5 hrs drive to Thimpu. The wonderful Thimpu valley from the Buddha point is incredible. The statue of Lord Buddha is the biggest stupa in Bhutan. Memorial chhorten was built in 1974, dedicating to the King of Bhutan- Jigme Dorji Wangchuck, who lead the Bhutan in a rapid progressive way with modernism. Tashichho Dzong locally means, Fortress of Glorious Religion, which was built in 1641 by Zhabdrung Ngawang Namgyel for the purpose of governmental wings. Completing today’s itinerary, walk around the capital city of Bhutan. Overnight at Thimpu. Day 04Drive back from Thimpu to Paro.It’s time to drive back to Paro. After breakfast, we drive back and we have the full day sightseeing in Paro. 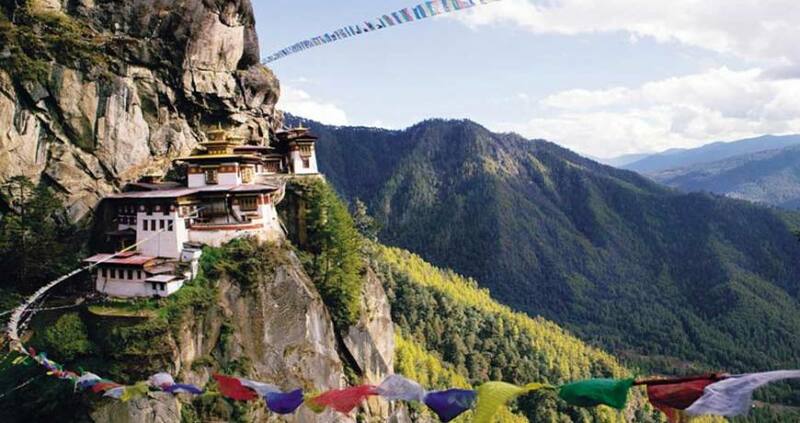 The iconic Tiger’s Nest or Taktshang Monastery is what represents Bhutan the most. It is widely renowned, located at 800 meters sheer cliff. It is assumed to have built in the 8th century. Guru Padmasambhava had a flight with tigress on this monastery. It is a brilliant hiking experience in Bhutan. It is also a unique experience to visit the farmhouse, which is a typical way of living with the husbandry profession. You can get food, milk and other farm’s productions. Visiting this place, back to your hotel and take a rest. Overnight at Paro. Day 05Fly back to Kathmandu. From Paro, fly back to Kathmandu and transfer to the hotel. You have time to buy souvenirs for your nearest and dearest relatives. Overnight at hotel. Day 06Departure. Its time to bid farewell. Representative of Nepal Kameleon Holidays drops you to the airport for your final departure. We hope to serve you time and again.